Why You Should Have Straight Teeth, This Might Surprise You. Recent research has shown a link between oral bacteria and a flareup of irritable bowel disease, The research identified that the bacteria invaded the bloodstream which then aggravated any existing irritable bowel causing the flareup, these bacteria are commonly found in the mouth! This research is linked to additional research which shows that the bacteria associated with gum disease and the more severe periodontitis can act as a keystone bacteria, this means their presence can instigate other processes and pathogens in the human body which can lead to Colon cancer and other inflammatory diseases. 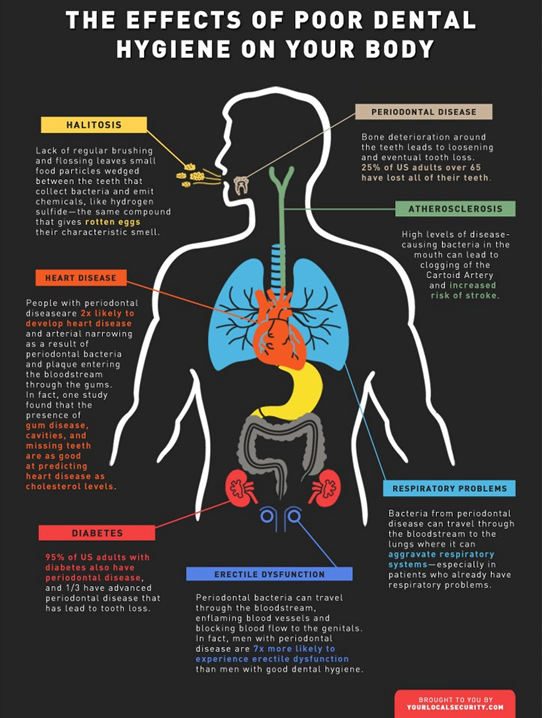 So it’s clear that not only will keeping your teeth clean ensure that your teeth are healthy, it also helps to promote overall body health… So where do straight teeth fit in? Straighter teeth are far easier to clean as you can get into those difficult to reach areas between your teeth. If your teeth are crooked or overlapping then it is harder to reach these areas, particularly with floss. This can lead to a buildup of these harmful bacteria which could eventually lead to the onset of other inflammatory diseases around the body. 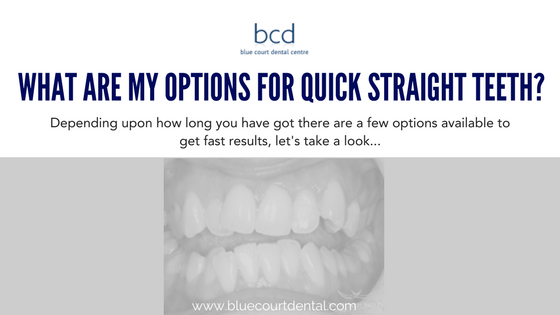 So now that you know the importance of straighter teeth, let’s look at some of your options if you decide to have braces. CFast is one of the most modern option for orthodontic braces in our Harrow dental practice. These braces is a combination of tooth coloured wires and clear brackets to straighten the front 6 teeth on the top and bottom jaw only. Because we are only straightening these front teeth we can move them much faster than standard braces which may also be moving the back teeth also. This makes CFast excellent for cosmetic orthodontics and also helps to straighten the teeth making them easier to clean. Six Month Smiles is is one of those orthodontic systems which does exactly what it says on the tin, straighter teeth in approximately 6 months! Once again, this is the modern alternative to classic train track braces and works with a trademarked clear bracket which is bonded due tooth. These brackets are barely visible and are able to achieve a predictable result using low forces with short overall treatment times which means the treatment is more comfortable, safe and allows you to keep your teeth cleaner, which is great if your overall body health. The results with six months miles can be quite amazing. The Inman aligner offers an alternative type of orthodontic brace. Both of the options above are fixed orthodontics, the Inman aligner is a removable option. This has the advantage of being able to use different forces in the way of springs to move your teeth. As you can see in this image these braces push and pull your teeth at the same time, working from inside your mouth and outside in unison with one another. 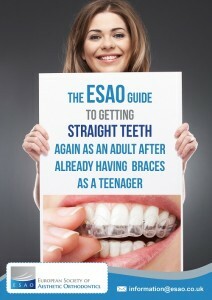 This unique way of using braces means we can achieve a straighter smile in approximately 12 to 16 weeks, much faster than any other orthodontic system. You would need to ensure that the where these braces for a minimum of 20 hours per day, removing them only to eat and clean your teeth. This means your commitment to wearing braces needs to be high with you strongly motivated to achieve your straighter smile. Once again, the Inman aligner is only used for the front six teeth to straighten them out providing you with an easier to clean smile. 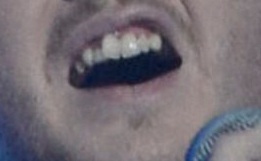 These braces, once again, do exactly what they say on the tin, they are clear! 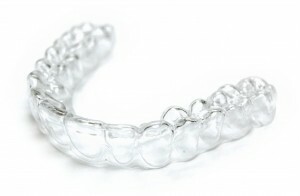 These clear braces work by applying a small amount of pressure to your teeth in the direction required to move them. 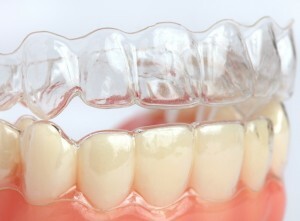 Once this small amount of movement has been achieved you will replace the removable clear brace with a new one. Typically replacing each race every two weeks. Treatment times are approximately one year with this system, depending upon how much your teeth need to move. 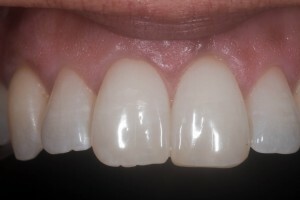 Once again we are normally only moving the front six teeth into a straighter alignment to achieve a more cosmetic result which is easier to keep clean. As with the Inman aligner you will need to wear your clear braces for approximately 20 hours per day, only removing them to eat and clean your teeth. You can even continue to wear them in full view of the public, perhaps whilst teaching or giving a presentation, nobody else will ever know! We recommend that you do some research online before deciding which dentist to go to to have orthodontics. The systems described above require that your dentist is certified to use them, we suggest you ask to see this certification at your initial consultation. Many dentists offer an initial consultation either at a discounted rate or for free, do spend some time looking at their website to see if this is on offer at the dental practice local to you. We also recommend that you ask the dentist for a series of reviews of their practice, this will leave you with peace of mind knowing that you have found a practice that other people like. A good dentist should also have a range of before and after photographs to show you, please ask to see them when you go for your initial consultation. The photographs should be presented nicely and you should clearly be able to see the difference between the before treatment and after treatment photographs. Seeing these images allows you to know that the dentist you have found can actually do what they say they can and achieve the results that you want. Most dentists will have a range of photographs, so asked to see photographs which are similar to your own situation. If you live in the Harrow HA1 area of Middlesex Then why not pop in to see us on the Watford Road. We are a modern dental practice offering a range of orthodontic braces to help you achieve a straighter and healthier smile… And we also offer a free consultation to anyone considering braces, please click here to download a voucher entitling you to this free assessment. 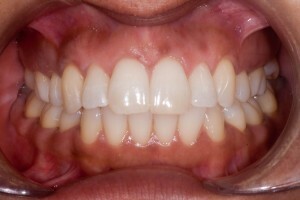 This entry was posted in Dentistry, Orthodontics, Share This Post and tagged cfast, clear braces, Inman Aligner, Irritable bowel disease, six month smiles on 14 July 2014 by Dr Nishan Dixit. Can my crooked front teeth be straightened ? This lady from Harrow wanted to improve the appearance of her crooked teeth by having them straightened quickly and effectively. She had braces when she was young, but as time went on, her teeth started to shift causing her front teeth to become crooked. 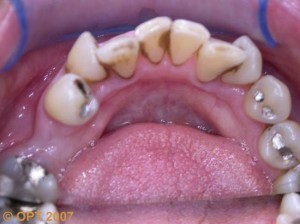 She did not want to have fixed braces again or to be treated by a specialist. 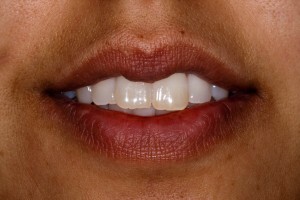 She preferred the convenience and speed of the Inman Aligner appliance. 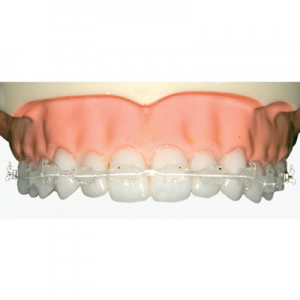 The Inman Aligner is a removable brace which applies gentle pressure to the front teeth that need to be moved. This gentle process is provided by the spring action of the appliance. 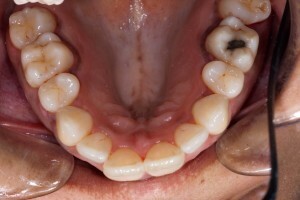 Within nine weeks, the teeth were gently guided to an ideal position that the patient was happy with. 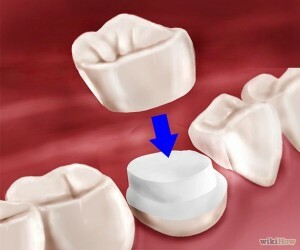 To maintain the teeth in place, a permanent bonded retainer was glued to the inside surface of the upper teeth. The patient was delighted with the results. It allowed her to achieve great results using just one appliance, in a short space of time. This entry was posted in Cosmetic, Dentistry, Orthodontics, Share This Post and tagged adult orthodontics, Bonded Retainer, clear braces, Inman Aligner, invisible braces on 19 March 2013 by Dr Nishan Dixit. Before starting any form of orthodontics, or indeed any treatment within dentistry at a new dentist, we recommend that you review some of the treatments and cases undertaken by your chosen dentist. To help you undertake this review we’ve written this blog post which takes a look at a range of orthodontic options so that you can best make your own decision about which one is right for you. Of course it is not possible to make a diagnosis online, so in every case you will need to visit a reputable dentist who is suitably trained in adult orthodontics who can then make the best decision for you, dependent upon your tooth position. A few years ago braces were only prescribed for children, however with modern advances in technology adult braces have become more popular. As more and more adults decide to have braces, it is becoming increasingly important for dentists to recognise the fact that many adults do not want to wear train track braces which are obvious and stand out. Due to this there have been a range of treatments for adults which overcome this problem by using either clear braces or tooth coloured braces. One of the big advantages of fixed orthodontics, such as you see with the metal train track braces, is their overall ability to move teeth faster than other forms of orthodontics. When this general principle is combined with a brand new design of orthodontic bracket, a whole new system is born – and that system is Six Month Smiles. By combining a unique tooth coloured bracket with conventional fixed orthodontics it is now possible to provide braces for adults in the local Harrow area. 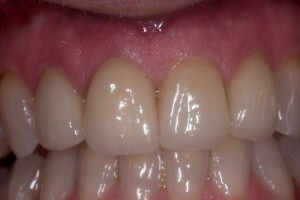 Notice the before photograph below, this patient did not like the gap between had to front teeth, and so by using tooth coloured braces it was possible to realign her smile and close up this space. 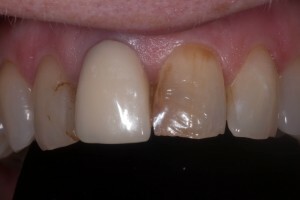 The problem with having gaps between teeth is that the gaps can often look black, this is a common problem which many patients mentioned to us. Six Month Smiles is a great way to move teeth and overcome this particular dental problem with misaligned or crooked teeth. Another way to have adult orthodontics or braces is to go for one of the almost invisible options. 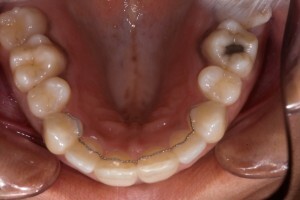 Rather than being fixed to the teeth permanently, this type of braces is removable. It works by applying pressure to the teeth in the direction that we want to move it, once the tooth has moved into the new position the clear brace becomes loose and does not work any more. We then simply supply you with a new brace which continues to put pressure on to the tooth. 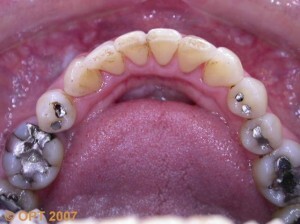 You wear a succession of clear adult braces until your teeth have moved to their final position. 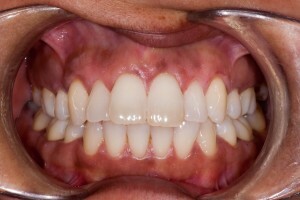 Take a look at the following cases, this patient was clearly not happy with the alignment of their lower front teeth. 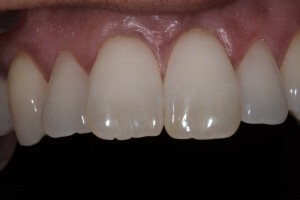 You can see that after treatment with clear adult braces the teeth are now in a nice arch line and any crooked or mis-alignment has been corrected using Clear Braces braces. The next option for adults who need to wear braces is what is commonly known as almost invisible. In this instance we are talking specifically about the Inman aligner which is a removable appliance. 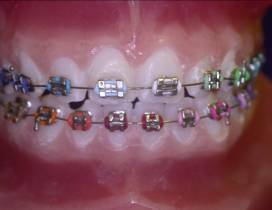 The orthodontic brace has metal springs which are visible towards the back of the mouth, however towards the front of the mouth the part of the brace that is normally seen is actually clear. The Inman Aligner adult brace is also a a modern invention utilising a revolutionary concept. 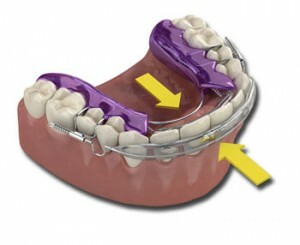 This brace works by a combination of pushing and pulling at the same time which makes for rapid movement of the teeth. Treatment can be as little as 12 to 16 weeks, which is generally much faster than any other adult orthodontic system. This adult brace is however only suitable for moving the front teeth into a more aesthetic and generally pleasing position. It cannot be used for more severe crooked or rotated teeth. As you can see there is no right or wrong adult brace, it depends upon the severity of your crooked teeth which need straightening. It also depends upon whether you want invisible braces which may take a little longer to move your teeth, or one of the less invisible options such as the Inman aligner or Six Month Smiles. 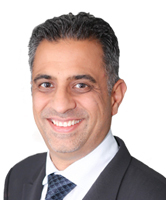 Blue Court Dental Centre is a local dentist in Harrow offering adult braces for the local people. We also offer a free orthodontic consultation for people interested in this form of treatment. 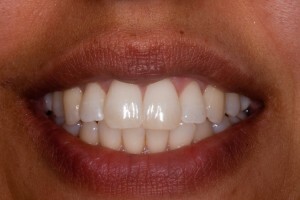 This entry was posted in Dentistry, Orthodontics and tagged adult orthodontics, clear braces, Inman Aligner, invisible braces, six month smiles on 27 November 2012 by Dr Nishan Dixit.